(Nanowerk News) By changing the direction of a magnetic field, so-called magneto-tactic bacteria are able to make a full U-turn. They can be taught line dancing in this way, inside the tiny micro channels of a lab on a chip. Magnetically steered objects will be capable of delivering medication, for example. Scientists of the MESA+ Institute for Nanotechnology and the Korean Institute of Science and Technology recorded an award-winning video about this. In microfluidics, bacteria or other particles that can be controlled from the outside, are very interesting: using an external magnetic field, the particle can be sent to the exact spot where it has to perform its task. Steering magnetically active bacteria is not as simple as it may seem, due to certain limitations of electromagnets. The MESA+ and KIST scientists now developed a transparent chip with channels 5 microns deep. Using this chip, they can examine the behavior of bacteria, in 2D, under the microscope. The channels offer enough space to make full U-turns, for example. The stronger the magnetic field, the narrower the bacteria turn. 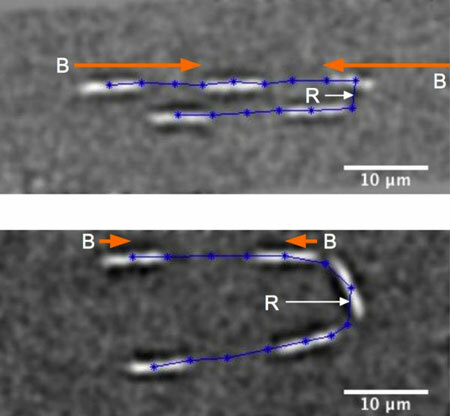 By varying the distance between the chip and the magnet – in this case, a permanent magnet and not an electromagnet -, the scientists demonstrate the relation between field strength and curve radius. When a small field is applied, the bacteria make a real turn (see images), at larger fields it looks like they reverse immediately. To explain their work, the scientist made a playful video, for which they received the new MicroTAS Video Award – MicroTAS is the abbreviation for ‘micro total analysis system’: a full chemical laboratory on a chip. This research has been done within the Transducers Science and Technology group of UT’s MESA+ Institute for Nanotechnology, together with the European branch of the Korean Institute of Science and Technology. The video was recorded at KIST in Saarbrücken. The paper ‘Magnetic manipulation of bacteria in microfluidics’ by Marc Pichel, Tijmen Hageman, Matthias Altmeyer, Leon Abelmann en Andreas Manz, was presented during the 18th International Conference on Miniaturized Systems for Chemistry and Life Sciences at San Antonio.